Choosing where your child will spend the day is one of the most important decisions you’ll ever make. Our care givers provide a warm and nurturing environment where children learn through play. 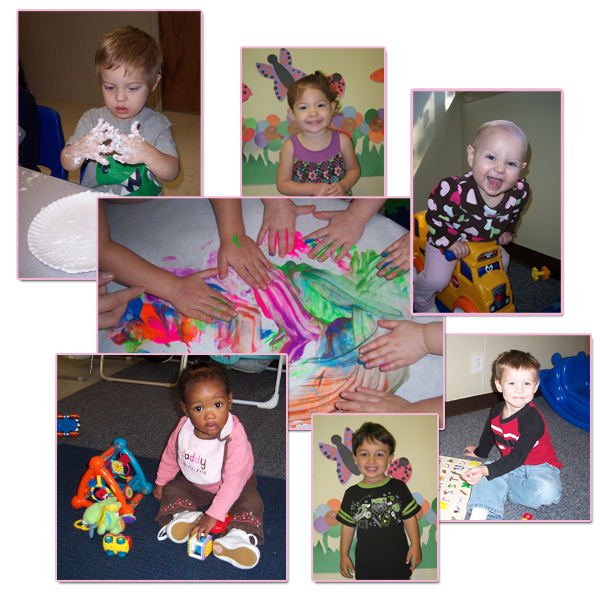 Bullfrogs and Butterflies Child Care Center is locally owned and operated. We operate our center as if our own children were enrolled, and they are! In short, everything we do revolves around family – yours & ours. Our classrooms are safe, clean, bright, and designed to be developmentally appropriate. Our outdoor playground is large and well equipped where kids can be adventurous and just be kids! It is the philosophy of Bullfrogs and Butterflies Child Care Center, that early childhood should be a time of fun, warmth, security, education, exploration and discovery. 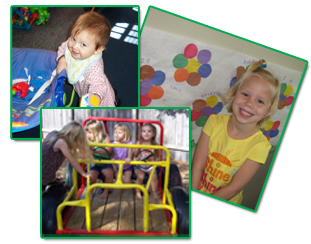 Bullfrogs and Butterflies Child Care Center will provide an atmosphere that encourages social, emotional, physical, and intellectual growth through the children’s play and small group instruction. Our facility is secured by a coded front entry keypad and magnetic locks. Our facility is equipped with a zoned fire safety system and we perform Monthly Fire Drills. All staff are CPR / First Aid Certified, Trained in SIDS, Shaken Baby Syndrome, and early childhood brain development. Caregivers also go through a FBI Background Check and Fingerprints are kept on file with DFPS. Parents are required to sign their children in and out of attendance upon arrival and departure using the biometric fingerprint scanner. As a result, no child will be released from the playground area. Our responsibility begins when you place your child in the care of a staff member and ends when you take him/her from the care of a staff member. Please do not allow your child to wander off unattended or leave the building ahead of you. For safety purposes, only those listed on the enrollment forms as designated person for pick up will be permitted to leave with your child/children. If a circumstance should arise for someone other than those on your list to pick up your child/children, you will need to update your list in advance. We will require a Valid ID for identification of an individual we do not recognize. Please inform those you have designated to pick up of our policy. *When dropping off your child, routine upbeat departures will make their transition to our care more comfortable. At Bullfrogs and Butterflies Child Care Center, your child will be exposed to the social-emotional & communication skills necessary to manage themselves, resolve conflict, and develop pro social behaviors. Parents will receive 2 copies of the discipline and guidance policy form that is consistent with subchapter L of minimum standards; one to keep and one to sign and return to Bullfrogs & Butterflies. Parents are welcome to visit the Center any time during the Center’s hours of operation to observe their child, the Center’s operation and program activities, without having to secure prior approval. Parents may also participate in the Center’s operation and activities. Parents have the right to breastfeed or provide breast milk for their child while in care. A rocking chare is available in infant rooms for comfortable seating. ** Holidays that land on Saturday or Sunday will be observed on an alternative day or days during the week before or after the holiday. Anytime the center will be closed a notice will be posted as a reminder. Administrative staff may close the center due to an emergency situation, including but not limited to, severe weather conditions. We are committed to the safety of our children, parents, and employee's. Closures and re-openings will be posted on KBTX. Bullfrogs & Butterflies Child Care Center is licensed by the state of Texas as a Child Daycare Center with the capacity for 76 children, 8 weeks to 12 years of age. Learning programs are based on developmentally appropriate practices. The Center serves a morning snack, lunch and afternoon snack to all children who are in attendance at the time of service. Meals are served at no extra charge. 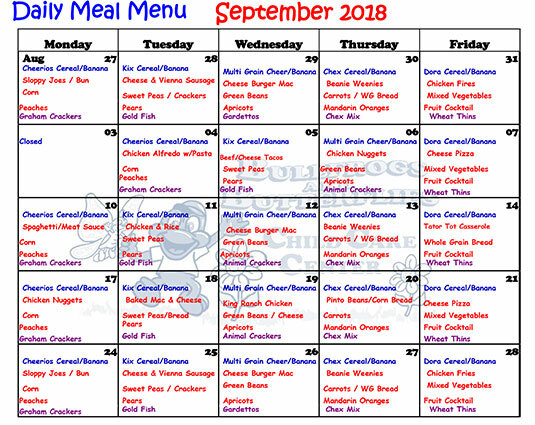 All three meals strive to meet the Department of Human Services guidelines for nutritious, appropriate foods for young children. Our Menus, kitchen facilities, and cooking procedures also follow their guidelines. Our kitchen is inspected regularly by the Brazos County Health Department. Bullfrogs and Butterflies utilizes Tuition Express to process all payments electronically. Payments can be auto-drafted or processed online. Credit cards are no accepted due to processing expenses. Tuition is based on the classroom, not on the child’s actual age. The administrative staff determines when children advance from one classroom to another. *Tuition is based on the facility and staffing that we must have available in order to care properly for your child. Therefore, if your child does not attend for any reason, tuition is NOT reduced. No reduction is given for unexpected closings, holidays, severe weather closings, absences, vacations, or domestic problems. *Tuition is payable in advance. Parents may pay for the entire month, or they may pay ½ of the month’s tuition on the 1st, and pay the other ½ by the 15th. Payments are considered late on the 1st working day after the due date. A fee of $5.00 will be assessed for each day payments are received late. *At the time of enrollment, a one-time non-refundable registration fee of $100.00 is required. *All children are required to sleep on a 4 fold Kindermat. Nap Mats can be purchased from the center for $15.00. *A quarterly material fee of $40.00 per child is charged in August, November, February, and May. -A late pickup fee of $5.00 is incurred for every 5 minutes (or portion thereof) that a parent is late in picking up a child past the designated pickup time. The pickup time is 5:45 p.m.
-A returned check fee of $25.00 is assessed for every check or electronic withdrawal returned by your bank. In addition, if the return causes your payment to be late, you are also assessed the appropriate late payment fee. I lost my daycare provider unexpectedly in the beginning of 2009. I was very fortunate to have a friend recommend Bullfrogs and Butterflies to me and to be able to place my daughter here. She had been in daycare from six weeks to a year old and private care from her first to her third birthday. She was very shy and had attachment issues. Today, she is a different child, and I attribute that to the care and dedication she has received at Bullfrogs and Butterflies. She has grown and developed not only socially, but her knowledge increased tremendously. My child is my most treasured possession, but I know when I drop her off in the morning that she is in good hands, and I can focus on my work. My daughter has been going to Bullfrogs and Butterflies for 3 and a half years. I am exceptionally pleased with the care that is provided. The staff is very friendly and genuinely care. The quality of care that my daughter receives has surpassed my expectations. The children have structure and learn in an interactive environment while still having fun. They are encouraged to use their imaginations and are not limited to their learning. My little girl has been going to Bullfrogs and Butterflies since she was about 6 months old. I absolutely love everyone there. My daughter has learned a lot since going there. She started walking and talking very early. She was taught some sign language to be able to ask for more, tell you please, and also to let me know when she is finished. She comes home almost every day saying a new word that she learned. Every day when I take her to daycare she jumps out of my arms to go give her teachers a hug. The teachers are so good with her. They give her the attention that she needs. When I pick her up in the afternoon she tells everyone bye and blows them kisses. I could not ask the girls to do anything more for my baby. She loves it there, and so do I. I tell everyone that I know that needs a daycare to send their kids to Bullfrogs and Butterflies because it is so CLEAN and the safest place I could take my daughter. Thank you to all the staff for doing such a great job with my baby!!!!! My son has been going to Bullfrogs and Butterflies for a year, and I couldn't be happier. He started going when he was 22 months. Almost three now, his vocabulary is AMAZING! This is not "open play" child care but a structured learning environment that the children love! Well done ladies! Very on top of it! We've been to two other daycares in town, but this one really has it together. It is well staffed with very low turn over. The thing I really appreciate is that Cindy and Kathy are educated about child development and what programs are available in the community. My child has some special needs, and they have been very involved in helping me find the right programs and resources as well as modifying my child's activities during the day at school. I also love that they do all the cooking (Yay for not having to pack a lunch in the morning!). Can't say enough good things about this place. Simply Amazing. I was blown away by the staff and facility. My 11 month old hated going to her old daycare and would cry every morning when I dropped her off. But, after one day at Bullfrogs and Butterflies, she literally tries to jump out of my arms and RUN to her room! She has never been happier and I can't say enough good things about this daycare. This is, hands down, the best place in town. Jordan's Mom Bullfrogs and Butterflies #1. This is absolutely the best daycare in town. My 2 year old loves to go there. Cindy and Kathy are very involved in their business, and I feel they truly care about my son. All of the teachers seem to really enjoy their job which really says a lot! Keep up the good work! You all are number one in my book. Words can't express how much you all are appreciated!!! Best Daycare Ever!!! I am so happy with Bullfrogs and Butterflies and even more pleased to see that the facility looks exactly like it does online...clean, safe, and kid friendly. My grand babies have been here for almost a year now. They really do love it, and they are learning so much. Cindy, Kathy, and their entire staff are just awesome. There's not a better daycare in BCS. Wouldn't put my child anywhere else! My son has been there since 3 months of age. I love it, and so does he. No worries about crying for Momma. Super Clean. I love this day care. I was hesitant at first because it's a fairly new facility but after meeting with the staff and seeing that all the children there are so happy, it made me feel much better about leaving my child. The staff is so friendly and very caring. I never go in and see unhappy children. My son is always so happy when I pick him up, and I feel very happy that he's in safe and caring hands all day. I am a new mother again after almost 14 years and absolutely love this facility. I enjoy knowing that my child is safe and happy. I never get that eire feeling that mothers sometimes get when they leave their child in someone's care. You know "Are they safe? Is there some place better? Is my baby happy? Will they know what to do if there is an emergency? Did I make the right choice?" I don't ask myself those things with this daycare. My child's face and his level of contentment reassure me everyday that they not only do their job, but also care dearly for him. The teachers are great and my child has a place for them in his heart as well as they do for him. Thank you ladies for this wonderful and clean place you have provided for my child. Very Pleased! We are new to Bullfrogs and Butterflies but Kathy and Cindy have been wonderful to work with. They are active owners in this business. The daycare is clean. The kids and parents that we have met there are happy. Keep up the good work! Very nice and clean daycare center, not to mention, when you walk in, it doesn't stink like most daycare centers. My child loves going, and his teachers are great. My little boy just started going to Bullfrogs and Butterflies, and he loves it. I have never felt more secure leaving him with anyone. His teacher's are so nice and communicate with me about his day. My kids love going to school every morning and usually don't want to leave when I pick them up. The ladies that run the daycare are awesome and have always taken great care of both of my children. 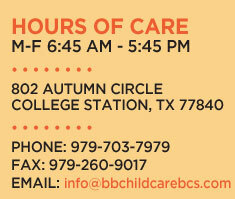 If you are looking for quality child care, this is the place to take your child. My daughter has been going to Bullfrogs and Butterflies since it was a home daycare, and she has learned so much more than I ever expected. The caregivers have always taken care of my child as if she was one of their own. Since they have moved, it has only gotten better. i would not have my child anywhere else. 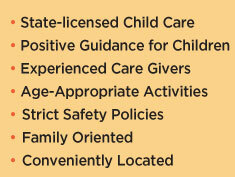 I highly recommend this child care center because it has a very warm and caring atmosphere. The staff works to ensure all children's needs are met. They also educate the children in fun and innovative ways. My child cries to stay because she has so much fun when she is there.